Easily explore the beauty & attractions of Victoria from our James Bay Location! This one bedroom apartment is within blocks of the inner harbour, downtown Victoria, Royal BC Museum, the BC Legislature and the historic Empress Hotel. Inside the front entrance you will find a luxurious king sized bed with high quality linens, memory foam and plush pillows as well as a cozy soft goose down duvet. Sleep like a King and/or Queen after a long day of exploring the many attractions Victoria has to offer. This is also perfect for working travellers and students who want a relaxing space to call home. Your private bathroom includes a bathtub with shower as well as makeup wipes, natural shampoo, conditioner, body wash (and of course a blow dryer, ladies!) You will also will have towels and cotton robes to enjoy. The next room in your private apartment is a warm and comfortable sitting room featuring a large couch/sofa bed, cable TV, FREE WIFI, coffee/tea nook and bar fridge stocked with cream, non dairy creamer and Brita water. This apartment is on the main floor of the house yet it is completely separate with a private front entrance and a private outside sitting area out the back. Should you wish to cook, make a snack or just chat with myself or other guests in the main house we have a fully equipped communal kitchen that is available for your use at any time by just walking out the back door of your apartment and coming in the door up the back steps. We have space in the fridge if you need it and if you choose there are usually a few kitties to cuddle. We are happy to welcome your pet and before you choose to book please let us know in advance as there are certain restrictions that must be discussed. Please be advised If we have not spoken beforehand and you arrive with your animal we may not be able to accomodate you. This is very much a home away from home! As an avid traveler myself I love hosting other travellers! My life has been an adventure, starting out in the film industry, going on to working at the TV station in Victoria for many years as a sound person with the news and ending with owning and operating Victoria Carriage Tours for 24 years while raising my three daughters. I decided to sell the businesse and start travelling for sports competitions, volunteering at retreat centres and working at festivals including as a black Ranger at Burningman and first responder at a number of other festivals such as the Tribal Gathering in Panama and this year the Oregon Eclipse festival. Last year I decided it was time to settle down (at least part of the year) and open my home to other travellers. This has been one of the most validating and rewarding things I have ever done. My guests have been kind, warm, interesting and wonderful. I look forward to hosting you and thank you for choosing my home to stay in while visiting Victoria. I know you will love it! Location is everything which is what makes this private space perfect for vacationers as well as business and student travellers who want a cozy and peaceful retreat after busy days! 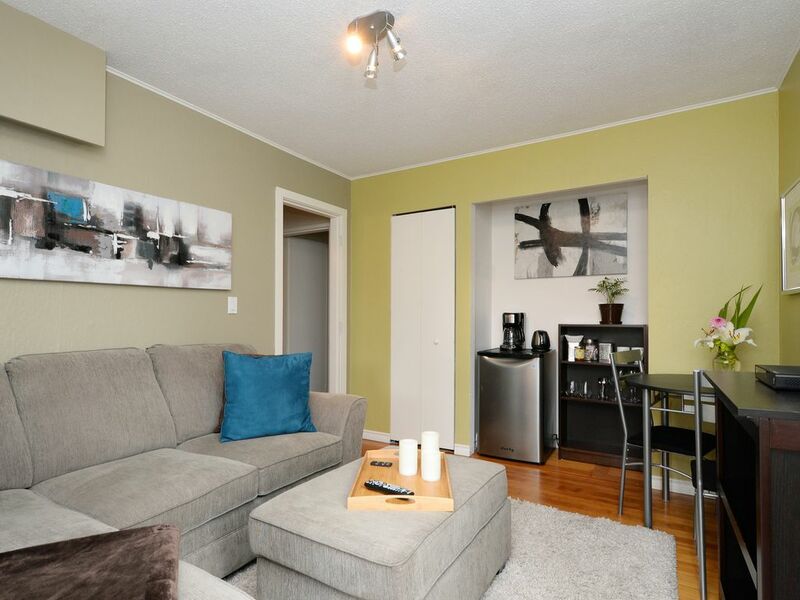 Situated in historic James Bay we are minutes away from shopping, groceries, pharmacy, liquor stores, coffee shops and cafes as well as many great neighbourhood restaurants. Staying in our very safe, peaceful, residential neighbourhood you can leave your car at home and walk most everywhere! There is a bus stop a half block up the street which will connect with a buses downtown to go to the ferries and Butchart Gardens. Walk 3 blocks and hop on the Clipper and Coho ferries, Harbour Air and the new V2V ferry as well as bus, carriage and harbour tours. Host lives on the property and is available in person, by phone or by text. We love animals and indeed have 6 cats and a puppy in our catio. Dogs and cats are welcomed only after a conversation as we feel big dogs could create problems with the other animals. Normally we only allow one dog and again there must be a discussion about their behaviour with other animals. So please do not bring your pet unless we have had a conversation ahead of time. Arriving early? We will happily let you leave your bags with us in the main house so you can get a early start on exploring. Leaving late? Leave your things with us after checkout and pick them up when you are ready. toilet, combination tub/shower, Shower pressure is fantastic. Also supplied is a coconut based shampoo and conditioner as well as an organic body soap. In the drawer you will find a new blow dryer. We are a short 15 minute stroll to the heart of Victoria with all the amazing bars and restaurants. Yes we are a few blocks from the Strait of Juan de Fuca which is gorgeous in both summer and winter. James Bay Village is a 10 minute walk from the house and has everything you could need for a long or short stay. A 24 hour grocery store makes it easy to pick up whatever you need for meals. Just a short walk to the Dallas road waterfront looking out over the Strait of Juan de Fuca. Lovely sunsets and the view of the Olympic Mountains is breathtaking. We are surrounded by water so can you can head to the inner harbour or walk along the shoreline path to the breakwater and Beacon Hill Park or across the Blue Bridge to Windsong Way. There are books in the main house to enjoy. Second visit, just as good! Super comfortable bed, bathrobes, and lots of fluffy white towels make this my first choice in Victoria. Convenient James Bay location and friendly host. I’ll be back! What a perfect stay! The home is cozy and perfectly located in James Bay (walking distance to everything! ), and the hosts Dianne and Muriel are friendly and welcoming. I felt very safe and right at home here. Sad to leave it. From beginning to end- a hassle free experience. Place was neat and clean and well equipped. I would definitely like to stay there again. Great Location. Clean and cozy. Great location near the waterfront and downtown. The apartment is attached to the house, but was private. Clean and nicely decorated. My only complaint is that we could hear music playing upstairs as we were trying to sleep-I think it's probably due to it being an older house. There were earplugs provided. Such a lovely place with great hosts. Will definitely book again when Victoria calls! A cozy spot in a great location with even a better host! There is something for everyone visiting Victoria from Whale watching with Orca Spirit, bike tours with the Pedaler, to live theatre and many great home breweries and restaurants.We are within walking distance of the McPherson theatre, the Royal theatre, Cineplex, Capital Six and the Vic theatre. Many hotels are close by such as the Oswego, Days Inn, Harbour Towers, Embassy, Laurel Point, Admirals, Huntington Manor, Coast Hotel and the Hotel Grand Pacific. If you have a convention at any of these hotels we are with a 10 minute walk of all of them. If you are doing government business the Legislature is also a 10 minute walk away. For people that want to whale watch the Orca Spirit is right below the Coast Hotel and Beasley's fishing charters are right there as well. For bike rentals and tours 5 minutes from the house is the Pedaler bike tours. Three blocks away is the Victoria Athletic Club which has an olympic sized pool and fully equipped gym and they do drop ins any day of the week. If you are looking to get to Butchart Gardens the bus is a half block away or you can walk to the Empress and take a double decker bus tour with CVS. The hop on hop off bus is a great way to spend time getting to see everything from Chinatown to Craigdarroch Castle. For the adventurous there are the Ghostly Tours and many of our guests have really enjoyed them. If you are looking for high tea the Empress is truly amazing and very pricey. There is the James Bay Tearoom up the street which has a wonderful high tea at 1/4 of the cost. There are kayak rentals at the Ocean River sports and SUP rentals as well. If you enjoy walking there is a wonderful walk down the street to Fisherman's Wharf along the Dallas road waterfront and the Breakwater to Beacon Hill Park and back through town to the house. If you have a dog with you along Dallas road is an off leash area. For meals there is an incredible variety so I will list a few of my favourites. For breakfast the James Bay tearoom, Nourish, Mole', Jam, Blue Fox and Shine. For a delightful lunch, Heron Rock, Bent Mast, Bellevilles, Milestones, and Pagliacci's. For dinner so many options. Rebar for vegetarian and Green Cuisine, 10 Acres for local, El Terrazzo for Italian, and Pagliacci's for a great vibe and good food. There are so many more with Japanese, tapa bars, sushi etc. Just too many to name. There are great home brew pubs and it is easy to google them and find one that fits for you. Victoria has some of the best home breweries in Canada. If you want to do a hike I will be happy to either take you or get you there for a minimal cost. The Royal BC Museum always has amazing exhibits and the Imax theatre is worth going to as well. We have at least 8 spas within walking distance, at the Parkside, Magnolia, Empress Hotel etc. In the winter walking through the inner harbour especially in the month of December is a real treat with all the decorations and lights up. In the other months there are carriage rides with Victoria Carriage tours and pedicab tours with Kabuki Cabs. Be sure to stop in at the Bug Zoo and the Bay Center for some mall shopping. Rogers and Purdy's chocolates for your sweet tooth. If you have any questions or need information feel free to ask Muriel or myself and we will be happy to answer any questions you may have.